What is chrismation? Nicholas Denysenko breaks open chrismation as sacrament of belonging by exploring its history and liturgical theology. This study offers a sacramental theology of chrismation by examining its relationship with baptism and the Eucharist and its function as the ritual for receiving converts into the Orthodox Church. Drawing from a rich array of liturgical and theological sources, Denysenko explains how chrismation initiates the participant into the life of the triune God, beginning a process of theosis, becoming like God. The book includes a chapter comparing and contrasting chrismation and confirmation, along with pastoral suggestions for renewing the potential of this sacrament to transform the lives of participants. Nicholas E. Denysenko is assistant professor of theological studies and director of the Huffington Ecumenical Institute at Loyola Marymount University, Los Angeles. He is the author of The Blessing of Waters and Epiphany: The Eastern Liturgical Tradition (Ashgate), as well as articles and reviews in journals such as Studia Liturgica, Logos: A Journal of Eastern Christian Studies, St. Vladimir's Theological Quarterly, and Worship. Few fields of theology are as confusing as that of the sacrament of confirmation. Many of those who grasp the complexities of the Roman Rite do not fully appreciate the practices of Eastern Rites. When Nicholas Denysenko takes you on a careful, clear, and informed tour of Orthodox chrismation, he opens doors that you probably didn't even know were there. 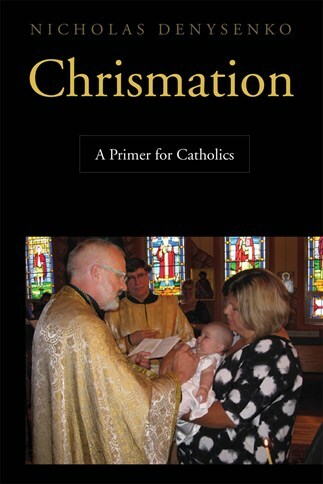 Chrismation: A Primer for Catholics makes a much-needed and invaluable contribution to a hitherto neglected area in the study of confirmation. Denysenko's creative conclusions will enlighten ministers, catechists, and the faithful of churches East and West. In this book on chrismation, Denysenko exemplifies the best in ecumenical liturgical scholarship. Drawing on both Eastern and Western sources, ancient and modern, he uncovers for the reader the richness and diversity of both traditions. Catholics and Orthodox alike will benefit from reading this work. Denysenko offers Catholics a primer on Byzantine chrismation, in order to set up a conversation between East and West. First, he gleans a liturgical theology from the rite's lex orandi, including its use for the reception of converts. Then he presents the perspective of numerous Orthodox theologians. And all this he can then bring to the table for an honest dialogue, since he is also well-versed in contemporary Catholic discussion about confirmation. The result is what he calls "a gift exchange," pointing out riches the East and West can share with each other. Being happily grounded in his own Orthodox tradition, yet ecumenically hospitable, he gives us a work that will cross-fertilize the Catholic understanding of confirmation and Orthodox understanding of chrismation. The superb result is a study that bridges the academic and the pastoral so as to regenerate our appreciation of this venerable liturgical celebration. "In the spirit of ecumenical action signaled by recent popes and patriarchs, this masterful contribution to mutual understanding of the sacrament among Catholics and Orthodox, East and West, may have the greatest potential to seal a final reunion and heal the wounds of division. Conceived in the tranches of pastoral ministry and born of productive research, Chrismation succeeds wonderfully at its stated goal ‘to unveil the mystery of chrismation and reveal it as a powerful sacrament of belonging capacitating the Christian to assume a holy identity in Christ in service in, to, and for the life of the world’ (p. 202). Few are better equipped to help us understand this mystery than Nicholas Denysenko."